The limited information available on the great collapse of the Bronze Age around 1177 BC provides some important clues to reconstruct the history. 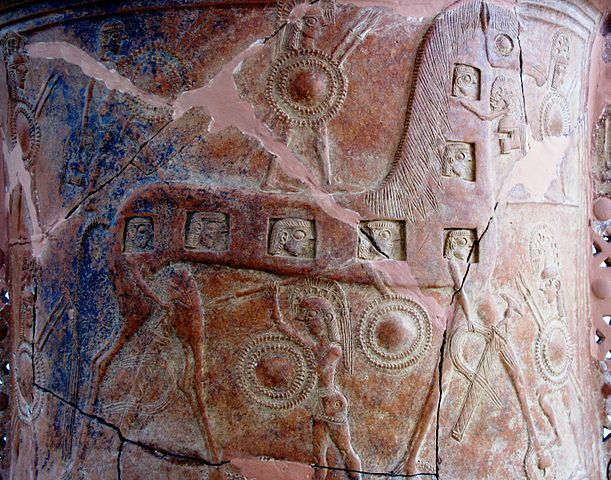 First of these clues is the appearance of horses and its role in the Trojan War. Nomadic Turkic Mongolian raiders from Eastern Asia were the first to domesticate horses and it became their fatal weapon of invasion and war during the Bronze Age. Horses became increasingly powerful components of Eurasia only from the middle of the second millennium BC. The Medes and Persians were especially rich in horses (Sanh. 98b). In Jewish times after the Hebrew Israelite era the horse seems to have become common in Canaan. The Turkic Jews brought with them horses from Babylon (Neh. vii. 68); and there was a “horse gate” in Jerusalem (II Chron. xxiii. 15). In connection with Zech. i. 8 the Talmud distinguishes red, yellow, and white horses (Sanh. 93a). Chariots were first introduced as a weapon in Egypt by the Hyksos (about 1700-1550 BC). Egyptians did not ride on horses but used them for chariots. Two horses are the rule. Horseshoes were not used. Another interesting and very important observation which is also a helpful clue is the similarity between the distributions of horses and domestication history in Asia, Europe and around the world with maps of Turkic raids and colonies. The US has the highest total number of horses. In Europe Russia has most horses, followed by Romania, Ukraine, Germany, France, and then The UK. Others with more than a million horse include: China; Mexico; Brazil; Argentina; Columbia; Mongolia; Ethiopia; and Kazakhstan. According to FAOSTAT (2005), there are 9.1 horses per 1000 persons in the world. The figure is highest for Latin America and Caribbean with 46.4 horses per 1000 persons followed by South America with 41, North America with 28.7, Oceania 11.1, Europe 8.9, Africa 4.6 and Asia 3.7. The discovery of iron and the invention of long sword brought additional weapon which caused the horrible wide spread collapses of many civilizations all around the Mediterranean. The resulting spectacular destruction created waves of the Sea People from masses of refugees and invaders. Troy’s ancient name was Ilion or Wilion. Ancient Greek historians variously placed the Trojan War in the 12th, 13th, or 14th centuries BC: Eratosthenes to 1184 BC, Herodotus to 1250 BC, and Duris of Samos to 1334 BC. An article on National Geographic Society says: “On April 24, 1184 BCE, the city of Troy fell to invading Greek armies, ending the Trojan War”. The Trojan War began when a Trojan prince kidnapped the wife of a Greek king. The woman, Helen of Troy, became “the face that launched a thousand ships,” when her husband, Menelaus, assembled a fleet of ships to retrieve her from Troy. The war between the Greeks (who actually called themselves Achaeans) and the Trojans lasted ten years. The Trojan War ended when the Greek commander Odysseus devised a plan to invade the walled city. The Greeks pretended to give up. Before leaving the Trojan beaches, they gave the Trojans a present—a giant wooden horse. The Trojans opened the gates to accept the horse. Inside the hollow horse were armed Greek troops, who sacked the city. Although Homer does not mention it, there is debate whether or not Achilles and Patroclus had a homosexual relationship. It is also noticed that homosexuality was not mentioned in records before the Bronze Age Collapse and it became frequent with the gradual collapse of the Western Roman Empire about 476 AD and these two great events were certainly Turkic. Indeed, when one reads the Iliad, either in prose or the poetic edition, there does seem to be too close a relationship between Patroclus and Achilles. Yet, it may have been a very strong friendship without sexual relationship. Truva was real name İlius. ili-Us meaning city of Us. Us-As-Oz-Uz is same a word just different pronounces. “il” is meaning city or country in Turkish language.